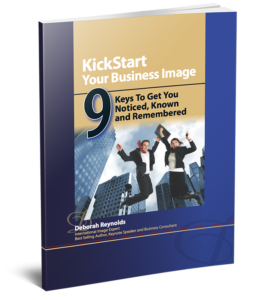 Building Your Business Image | Deborah Reynolds | About Face Image Consulting, Inc.
Time and attention needs to be given diligently to enhancing your business image and to marketing strategies. These two factors are essential for business success. Generating profits during this recession is top of mind for most business owners. In my Business Acceleration Bootcamp participants spend considerable time on the Revenue Model. Perhaps it’s time to take a look at your Revenue Model and examine exactly how the money is flowing in. What are you offering in the way of products and services? Consider adding on a variety of other products and services to meet your customer needs. Packaging or bundling to create another attractive price point and exceptional value is another effective marketing strategy. Building your business image is enhanced by offering a great selection to clients. It’s a great way to get noticed, known and remembered. If you are struggling with an effective Revenue Model, drop me an email at info@AboutFaceImage.com and let see if my Building Your Business Image Coaching Program might be exactly what you are looking to generate more leads and profits.